Remember that you’re representing your boss and your company. In the grand scheme of things, you do not want to be known as the schmuck who got sloshed at the hotel bar and used the company card to shop on eBay. On a less dramatic level, you also don’t want to be known as the individual who let sleep deprivation get the better of her and lost her patience with a client. When you speak to others on a business trip, you’re not just speaking for yourself. You’re speaking for the whole company. I’ll admit that it’s a lot of pressure, but it’s actually easier than teaching. When teaching, you have to impress students, many of whom don’t want to be in the class. You’re only in the class for a short time, but it’s exhausting trying to sell yourself all the time. It’s like one painful job interview that happens over and over again. With a business trip, the real issue is stamina. The customer or client is probably already in some sort of business relationship with you, so you actually don’t have to sell as hard as you would in a classroom. You just need to show that you are a professional and finish the task at hand. If you follow the tips from the days past, which amount to being prepared and maintaining a good relationship with everyone else on your team, you’re going to be just fine. My last installment of the Business Travel Survival Guide is a little more mundane, as it involves one of the most dreadful aspects of business travel–the expense report! 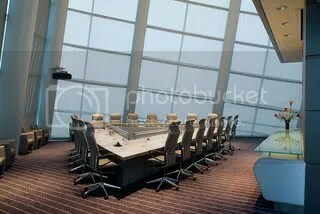 Image of a boardroom at the Virginia Beach Convention Center by Vbccevents, from Wikimedia Commons under a Creative Commons license.